Q: I know I should advertise my book, but don’t know where to begin. What kind of message should I be communicating? A: The last couple ‘Ad Man Answers’ columns were numbers-heavy – meant to give a foundation of general media terms. Today’s topic requires no math, so writers of the world, rejoice! 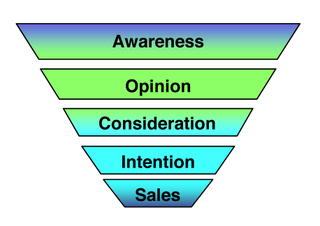 The purchase funnel was popularized by the syndicated research company Allison-Fisher, to help quantify the habits of automobile buyers. It presumes that when shopping for a car – or any product, really – consumers start with a broad shopping list, then narrow down their options until making a purchase decision. Thus, the consumer will be more receptive to different types of advertising messages depending on where they are in the funnel. A college student living in a dorm doesn’t notice the same things in an auto advertisement as someone with a lease about to expire. The top of the funnel, AWARENESS and OPINION, are when advertisers direct consumers towards a general impression of their brand. Think of Volvo automobiles… what one word comes to mind? “Safe.” That impression has been reinforced over time by ads like this 1989 TV spot, where a family avoids a myriad of natural and man-made hazards while the Bee Gees’ “Staying Alive” plays on the car stereo. Not a single line of dialogue, yet the ad communicates the benefits of owning a Volvo – no matter what, you’ll safely get to your destination. 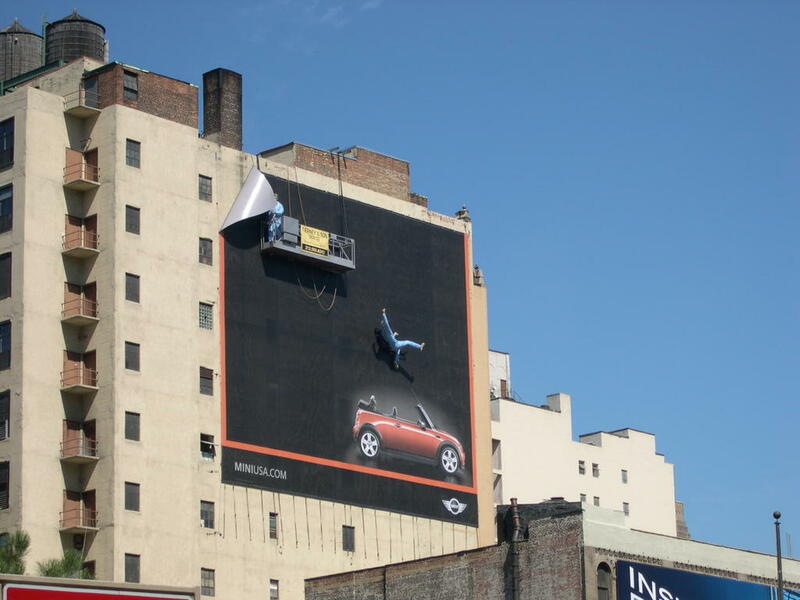 Scion is also a master of pure brand advertising. Their commercials make a tiny econo-box seem hip and desirable. They define themselves as “cool” by creating an animated world, complete with urban soundtrack. Anybody remember Isuzu? Yes, they still make vehicles in the U.S., but their auto sales have plummeted from the “Joe Isuzu” heyday (peak of 127,630 sales in 1986), to less than 15,000 sales/year. Consequently, Isuzu has virtually halted all North American advertising. Contrast that to Toyota, which sold over 2 million cars while spending over $1 billion in U.S. media in 2006. Because Isuzu no longer spends money to make general consumers AWARE of their brand, few car buyers have an OPINION about the products they make… so it’s hard to image them making a rebound. In the book world, ‘Upper Funnel’ advertising appears to be as popular as the Isuzu Oasis minivan. The big names in fiction who can most afford it – King, Koontz, Grisham, Patterson – already have established fan bases. They don’t have a burning need to define themselves to the general public. So when top-tier authors advertise, it’s mostly ‘Middle Funnel’ advertising, talking about when the next book is coming out. Newbie writers, who are most in need of “creating a name for themselves,” usually don’t have the large advance or publisher support to mount an ethereal brand advertising campaign. They’re focused on earning out, getting the next book deal, seeing immediate return-on-investment for every marketing dollar. The authors who are probably the best fit for ‘Upper Funnel’ advertising are the ones with at least a half-dozen books on the shelf, solid recognition within their genre, but haven’t achieved universal awareness. Harlan Coben did what I’d consider ‘brand advertising’ – albeit on a small scale – by sponsoring 5 baseball/softball teams (“Harlan Coben’s Thrillers”) in his New Jersey hometown. His involvement wasn’t tied to a specific release date, didn’t compare himself to anybody else, but helped drive name recognition and engender goodwill. What if Coben were to expand his sponsorship and spend $100,000 sponsoring little league teams around the country? Would he recoup his investment with incremental book sales? Hard to say. Because ‘Upper Funnel’ advertising is fuzzy and non-specific, its benefits are spread over time. He may attract enough new readers to break-even several books down the line. Going back to the auto industry, Scion didn’t see an immediate spike in sales from just running those animated hip-hop TV commercials. However, by sticking with that campaign – in addition to other urban sponsorships – they’ve built their brand into something with cachet. I think the key to using ‘Upper Funnel’ advertising to lift a solid seller to Dan Brown heights is by cutting Oprah in on the deal. Best media vehicles for ‘Upper Funnel’ advertising: TV, Outdoor billboards, event sponsorships, viral marketing, cause-related marketing, and lifestyle-oriented websites. Next time in ‘The Ad Man Answers’: ‘Middle Funnel’ and ‘Lower Funnel’ advertising. Gregory Huffstutter has been punching Ad Agency timecards for the past decade, working on accounts like McDonald’s, KIA Motors, and the San Diego Padres. He recently finished his first mystery, KATZ CRADLE. The first 100 pages of his novel are linked here. For general advertising questions, leave a comment or send e-mail to katz @ gregoryhuffstutter dot com with “Ask The Ad Man” in the subject line.